of Indian culture during the Mississippian period. 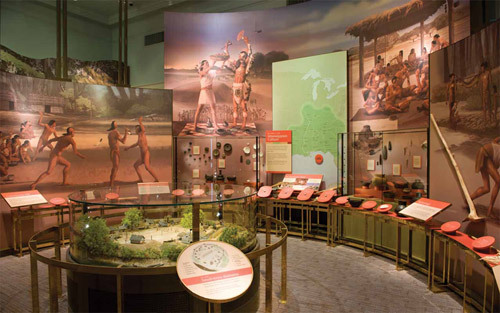 For decades the Alabama Department of Archives and History (ADAH) has educated citizens of all ages on the diverse history of the land that makes up our state. By late 2013, the ADAH will have another significant resource to help in this mission. Called the Museum of Alabama, this series of exhibits will delineate a range of significant periods in Alabama’s history, giving visitors a new understanding of such topics as “The Land of Alabama,” “The First Alabamians,” “Alabama Voices,” and “Alabama Treasures.” The ADAH has also worked carefully to tie these exhibits to the state’s educational curriculum, offering schoolchildren from across Alabama the chance to encounter artifacts from the periods they are studying. Although several phases of the museum have already been completed, the remaining phases are still underway. 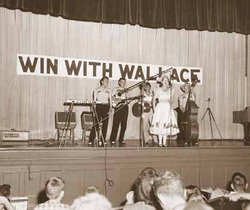 Readers of Alabama Heritagecan help make the Museum of Alabama a reality by making a tax-deductible contribution to the Alabama Archives and History Foundation, P.O. Box 300100, Montgomery, AL 36130. 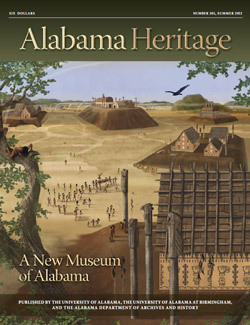 For further information on the ADAH or the Museum of Alabama, please visit their website. Steve Murray is Assistant Director for Administration at the Alabama Department of Archives and History (ADAH). Prior to joining ADAH in 2006, he was managing editor of the Encyclopedia of Alabama andThe Alabama Review. He is a past president of the Alabama Historical Association and serves on the Council of the Alabama Museums Association. Editor’s Note: Readers may remember Rafe Blaufarb’s article “Alabama’s Vine and Olive Colony: Myth and Fact” in our Summer 2006 issue. In that article, Blaufarb introduced readers to the history of Alabama’s Vine and Olive Colony,a nineteenth-century settlement by French exiles in Marengo County. The exiles fled France in 1817, after Napoleon was deposed, and Congress granted them lands in Alabama to begin planting grape vines and olive trees. With Blaufarb’s article, former Alabama Heritage editor Suzanne Wolfe informed readers about an intriguing discovery of letters that were written from Demopolis by one of the colonists. In our new article, Éric Saugera, the historian who found the letters in France and author of Reborn in America, a new history of the Vine and Olive Colony, brings to life the story of their author, Jacques Lajonie, and reveals new details about daily life in the colony. When a toothache led French historian Éric Saugera to the dentist, he little expected to discover a fascinating history of an Alabama colony. But that’s exactly what happened. Saugera’s dentist shared a trove of letters his ancestors, who lived for a time as exiles in Alabama’s Vine and Olive Colony, sent from the states back to France. Written by Jacques Lajonie, whose loyalty to Napoleon proved dangerous after the emperor’s fall from power, the letters offer a rare glimpse of life on the Alabama frontier and the struggles of pursuing an agrarian life in a land far from home. They also reveal new connections between Alabama and France, showing common threads between these distinct nations. For more information about Éric Saugera’s Reborn in America French Exiles and Refugees in the United States and the Vine and Olive Adventure, 1815-1865, please visit the University of Alabama Press site. Éric Saugera, Ph.D., is a French historian born in Brittany, in western France, in 1952. He currently lives in Nantes. A specialist in the study of the French slave trade in the nineteenth century, he has since 1985 published many articles and books on the subject. His Bordeaux, port négrier (1995) has become a classic. While doing research for this work, he discovered the letters that Jacques Lajonie, a former officer in Napoleon’s army and in exile in Demopolis, Alabama, wrote to his family and friends between 1817 and 1829. Thanks to the support of Atlanta attorney Bradley Hale and Gwyn Turner of Demopolis, Éric Saugera was able to live in Demopolis from 2002 to 2004 to follow, two centuries later, the steps of Jacques Lajonie. For more resources connected to the “Scottsboro Boys” story, please see the Scottsboro Boys Museum and Cultural Center website. Thomas Reidy is a doctoral candidate at the University of Alabama. He is currently writing a dissertation on antebellum professionals in Alabama from 1800 to 1860. Reidy is a part-time instructor at the University of Alabama in Huntsville, where he has taught courses in world history, Western civilization, and American history since 2007. In addition, Reidy works with the University’s New College, supporting the efforts of the Scottsboro Boys Museum and Cultural Center. He is a past recipient of the Frank Lawrence Owsley Award for outstanding competency in history and winner of the Friends of the Alabama Department of Archives and History Fellowship in 2010. “Awaiting Justice” is Reidy’s second publication in Alabama Heritage. His article featuring antebellum doctor Thomas Fearn appeared in the magazine’s Spring 2012 issue. Although we now consider spring break at the beach as common a paring as peanut butter and jelly, this tradition of coastal vacations was not always so ingrained in cultural norms. Like everything else, it originated somewhere, and Harvey Jackson’s article details that origin story, weaving together a colorful cast of characters that includes former University of Alabama quarterback Ken Stabler, writer Howell Raines, and a fish (or is it a bird?) called mullet. If you’ve ever sipped a beverage under the lingerie-draped eaves of the Flora-Bama, this article is for you. Harvey H. Jackson III is Eminent Scholar in History at Jacksonville State University. This article is based on material used in the writing of his book, The Rise and Decline of the Redneck Riviera: An Insider’s History of the Florida-Alabama Coast, which was published in 2012 by the University of Georgia Press. Portions of this article have appeared in various forms in “The Rise and Decline of the Redneck Riviera: The Northern Rim of the Gulf Coast since World War II,” Southern Cultures, Spring 2010, and in articles and columns by the author that were published in the Anniston Star, Longleaf Style, and the Mobile Press-Register. When author Mary Riser started looking for a country house, she little suspected that she would find it in an abandoned building. However, with the help of two ardent preservationists—Riser’s mother, former state senator Ann Bedsole, and architect Nicholas Holmes Jr.—Riser discovered that sometimes even the roughest structure can be rehabilitated and restored. In this quarter’s installment of the Southern Architecture and Preservation department, Riser details how she bestowed new life on an abandoned Clarke County hunting camp and preserved a piece of Alabama’s architectural landscape. Mary Riser, a former teacher at the University of South Alabama and Spring Hill College, currently works on documentaries. Robert Gamble, standing editor of the “Southern Architecture and Preservation” department of Alabama Heritage, is senior architectural historian for the Alabama Historical Commission. This quarter’s “Becoming Alabama” articles trace events that had effects on Alabama and the world beyond. 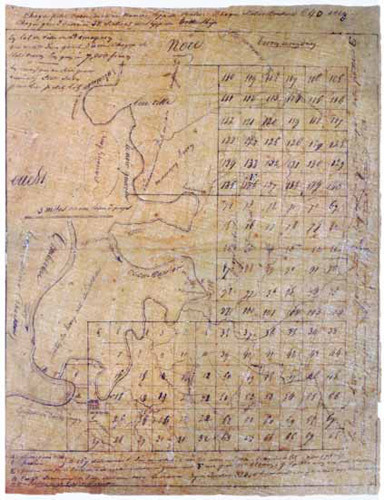 Joseph Pearson discusses the start of the War of 1812, showing how many Creeks and white settlers in the Mississippi Territory concurred in their enthusiasm for what they believed to be a “second war of independence.” Covering the Civil War era, Megan Bever charts the crucial role of ammunition and materiel, showing how Josiah Gorgas, as the Confederate States of America’s Chief of Ordnance, helped aid the southern war effort. 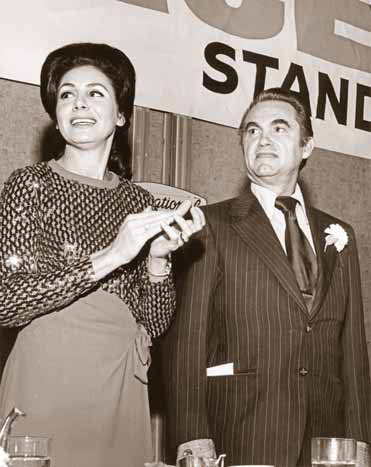 Finally, Matthew Downs revisits the summer of 1962, when two candidates vied to become Alabama’s next governor. Matthew L. Downs (PhD, Alabama) is an adjunct professor of history at Birmingham-Southern College. His dissertation focused on the federal government’s role in the economic development of the Tennessee Valley. 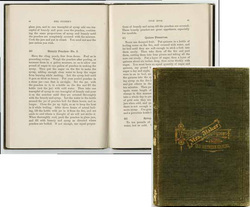 "What Mrs. Fisher Knows about Old Southern Cooking"
In this new department, Alabama Heritage explores from the state’s libraries, museums, and private collections, bringing to light little-known treasures. In this initial installment, the department’s standing editor, Louis Pitschmann, discusses the Lupton Collection, a rare assortment of African American cookbooks held at the W. S. Hoole Special Collections Library at the University of Alabama. Reading through the cookbooks, one gathers a sense of how African American cooks, particularly those from Alabama, have influenced what we now consider traditional American fare. 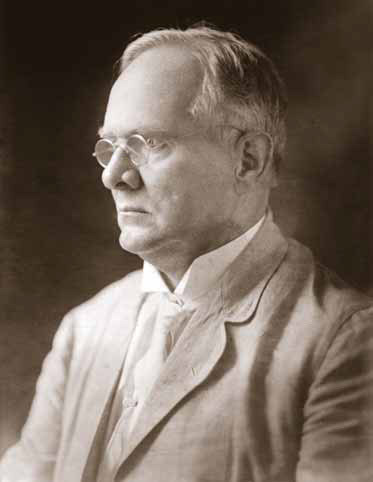 Louis A. Pitschmann, standing editor of the “Revealing Hidden Collections” department of Alabama Heritage, is Dean of the University Libraries at the University of Alabama and director of the Alabama Center for the Book, which co-sponsor this department. When one thinks of intolerance, generally issues of racial prejudice come to mind. However, many people fail to realize that for a number of years, many southerners held a bias against Catholicism. As the twentieth century dawned, anti-Catholicism gained prominence as a political stance, and it eventually filtered into personal belief systems as well. However, following a Methodist minister’s 1916 murder of a Catholic priest, many Alabamians decided things had to change. Arthur Remillard revisits the death of Father James E. Coyle and considers its continued influence on Alabama. Arthur Remillard is assistant professor of religious studies at Saint Francis University (Loretto, PA). He is the author of Southern Civil Religions: Imagining the Good Society in the Post–Reconstruction Era(University of Georgia Press, 2011) and the book review editor for theJournal of Southern Religion. Joshua D. Rothman, standing editor of the “Southern Religion” department of Alabama Heritage, is associate professor of history at the University of Alabama and director of the university’s Frances S. Summersell Center for the Study of the South, which sponsors this department. the Wheeler National Wildlife Refuge. The Tennessee Valley: Gator Country? Although the American Alligator commonly appears in warm climates such as Florida, its historical range is much broader—a fact that many visitors to Wheeler National Wildlife Refuge in the Tennessee Valley learn firsthand. The reptiles have a complicated history at the site, though their presence dates back at least forty years. Through their decades at the refuge, the alligators have sparked a number of reactions among nearby residents, causing both excitement and fear. Thomas Ress evaluates the alligators’ presence, positing possible sources for it and discussing how we might come to coexist comfortably with these creatures. To learn more about Wheeler National Wildlife Refuge, please visit its website. Thomas V. Ress is a freelance writer who resides in Athens, Alabama. He writes about adventure, outdoor destinations, and Alabama history. 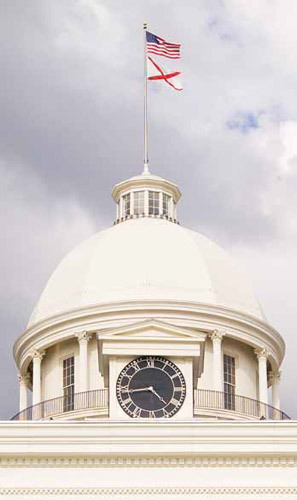 In 1852 Montgomery’s capitol building gained a lovely addition: a striking tower clock. Today, the piece stands as a rare example of the art of American clock making. As author Thomas Kaufmann explains, the structure also links Alabama’s capitol to one of the preeminent figures in American history—Paul Revere. 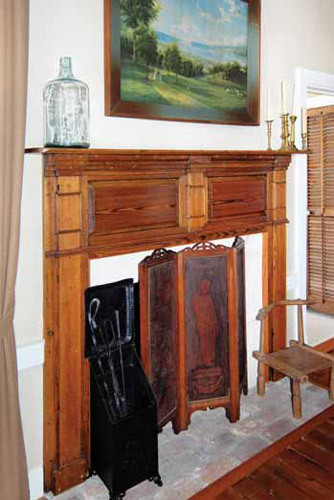 Thomas Kaufmann is a Montgomery artist and preservationist. For more information, please visit his website. Many thanks to the Alabama Department of Archives & History, Revere bell scholars and authors Edwin and Evelyn Stickney, Patrick M. Leehey of the Paul Revere Museum–Boston, John Eachus of John Eachus and Associates, First Church in Jamaica Plain, Massachusetts - Unitarian Universalist, and David W. Graf Tower Clock Repair and Restoration, for generously sharing their expert knowledge, scholarship, & research on The Capitol Clock, Howard & Davis Boston, and the Revere/Hooper/Blake Foundry. Read the entire article here as a downloadable PDF. 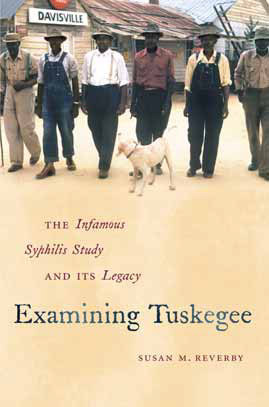 In this quarter’s installment, Stephen Goldfarb surveys several books on the infamous Tuskegee Syphilis Study, in which scientists charted the effects of the disease on infected African American men. 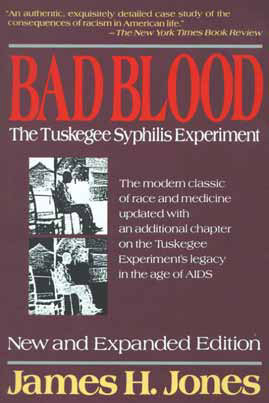 Goldfarb reviews Bad Blood: The Tuskegee Syphilis Experiment by James Jones (Simon & Schuster, 1993); Examining Tuskegee: The Infamous Syphilis Study and Its Legacy by Susan M. Reverby (University of North Carolina Press, 2009); and The Tuskegee Syphilis Study: The Real Story and Beyond by Fred D. Gray (NewSouth Books, 2002). Taken together, these texts offer a comprehensive appraisal of the study’s purpose and conclusions, along with its moral implications and efforts made to atone for it.